Above: Highdown Gardens, exotic beech in misty light. G3 with 12-32mm, 1/25s at ƒ8. Below: Highdown pond, 1/200s at ƒ8. Tony has a photo book devoted to images of this garden. Above right: Nymans Gardens in June with bright foliage, 1/320s at ƒ8. while. My photography has been about colour – it has a big impact on me; texture, shape and form. When I was at college, everyone was doing black and white and I was the only one doing colour. It’s reversed now, with most people doing colour and I’m shooting black and white. 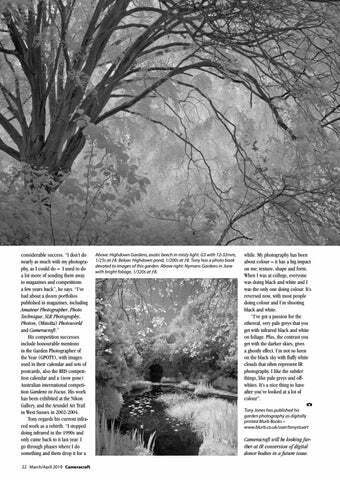 “I’ve got a passion for the ethereal, very pale greys that you get with infrared black and white on foliage. Plus, the contrast you get with the darker skies, gives a ghostly effect. I’m not so keen on the black sky with fluffy white clouds that often represent IR photography. I like the subtler things, like pale greys and offwhites. It’s a nice thing to have after you’ve looked at a lot of colour”. Cameracraft will be looking further at IR conversion of digital donor bodies in a future issue.